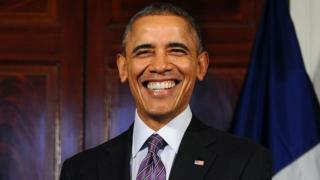 President Barack Obama recently joked that he was hoping for a job at Spotify when he leaves the White House. And it seems the music streaming service is keen to oblige him, after it posted on its careers page a vacancy for "President of Playlists." The job ad says applicants should have "at least eight years' experience running a highly-regarded nation". It also calls for "a friendly and warm attitude, and a Nobel Peace Prize". Spotify CEO Daniel Ek gave the commander-in-chief a heads-up on Twitter, writing: "I heard you were interested in a role at Spotify. Have you seen this one?" before linking to the affectionate ad. While the posting does not name Mr Obama, it nods to his best-known buzzwords, saying Spotify is "full of hope, and always open to change". The "What you'll do" section says the candidate will identify new playlist ideas, "from a playlist for shooting hoops with your friends, to the perfect warm up playlist for addressing the nation about health care legislation that bears your name". "Ever had Kendrick Lamar play at your birthday bash?" it asks - "We'd love to hear about it!" Lamar joined Mr Obama at his 55th birthday, and the president has called him his favourite rapper. Image caption President Obama (with his daughter Malia) has welcomed many singers to the White House, including Janelle Monae (right) and Kendrick Lamar (left). The advert also takes a swipe at President-elect Donald Trump, saying the President of Playlists must "attend daily briefings", and "analyze data and performance of playlists ... using all available intelligence". Mr Obama has been sharing playlists of his favourite music via Spotify since 2015, including tracks by Nina Simone and Bob Marley, and - for Christmas 2015 - Mariah Carey's seasonal super-hit All I Want for Christmas Is You. Spotify is a Swedish company, and according to Natalia Brzezinski - wife of the former US ambassador to Sweden - the president told him last week: "I'm still waiting for my job at Spotify... Cuz' I know y'all loved my playlist!" She posted about the encounter on Instagram, adding that Mr Obama loves Sweden and plans to visit again "really soon". It is not currently known what the 44th president will do when he leaves the Oval Office. Community activism and teaching have been mooted, while he has ruled out being a Supreme Court judge. In interviews, he has said he wants to help nurture the next generation of Democrat leaders - and ideally run an NBA basketball team.